INDIANAPOLIS – Ivy Tech Foundation has received a $22.9 million grant from Lilly Endowment Inc. for the purchase and renovation of the former Stouffer’s Hotel at 2820 N. Meridian St., just north of the main Indianapolis campus. The $22.9 million grant is the largest gift/grant in its history. The 196,000-square-foot facility includes 13 floors and a rooftop space. The purchase and renovation of the building will continue to expand the Indianapolis’ campus footprint and mark the second time in less than two years that the community college has renovated and restored existing buildings on its campus. In August 2009 Ivy Tech announced plans to construct a new state-of-the-art classroom building, including a community gathering place, on the site of the former St. Vincent Hospital on Fall Creek Parkway. The façade of that building will be preserved and classes will start being offered there in 2012. Currently the Ivy Tech Central Indiana campus is one of the nation’s fastest growing community college campuses. It has the third largest undergraduate enrollment in the state with nearly 22,400 students (behind only Indiana University-Bloomington and Purdue University-West Lafayette campuses). Since 2005 the Central Indiana campus has almost doubled in enrollment. “We are honored that Lilly Endowment has made this investment in Ivy Tech Community College. This allows us to continue to develop an educational corridor in this important part of the city,” Ivy Tech President Thomas J. Snyder said. “The return on that investment will be a world-class training center for the state of Indiana. “We envision having the ability to do short-term workforce training at various levels and expand our degree-program offerings. There will be resources for displaced workers looking for a career change along with programming and training for the incumbent workforce to help companies become as competitive as possible. We also see a corporate environment where managers and executives can receive training to ensure optimal efficiency for their companies,” he said. The facility will be named the Indiana Center for Workforce Solutions and will house the college’s workforce development operations, selected academic offerings including the popular culinary program, distance learning education, and the community college’s statewide administration. The renovated facility will host community forums and house expanded course offerings that will give Hoosiers increased access to training. Ivy Tech estimates the center will be able to accommodate training for 25,000 individuals a year and host meetings and events for more than 300 organizations. A timeline for the renovations and the opening of the center is currently being developed. “For Indiana to compete in the global economy its workforce must have the skills and other qualities required by employers. Ivy Tech plays an essential role in preparing Indiana students to meet these requirements,” said Sara B. Cobb, vice president for education at the Endowment. “The dramatic growth in Ivy Tech’s enrollment demonstrates that Indiana residents understand that education is critical to their future. The new space should significantly help Ivy Tech in the accomplishment of its important educational aims, and Lilly Endowment is pleased to provide assistance,” added Cobb. “The Indiana Center for Workforce Solutions will play a key role in sustaining our region and our state as centers of economic activity for our next generation. Cultivating a well-educated, well-trained workforce is critical to our continued success in attracting new jobs and investment, and The Lilly Endowment gift that makes this Center possible will improve Ivy Tech’s capacity to pair Hoosiers with opportunities for education and careers,” said Mayor Ballard. The workforce development operations within the center will include state-of-the art short-term training programs for the key industry sectors in the state including healthcare, life sciences, information technology, advanced manufacturing, logistics, hospitality and energy. The added space and new technology will allow Ivy Tech to continue to expand its relationships with employers across the state by providing real workplace simulation labs and offering more than 2,500 certification exams including high-stakes nationally recognized tests. Plans include conference rooms equipped with videoconferencing capability that can be used to connect multiple employer locations around the state for training. In addition, the center will offer pre-employment services to individuals by assisting with resume writing, interviewing skills, and soft-skills training while also providing additional services for displaced workers. It will also become the community college’s distance education hub. Ivy Tech is currently the state’s largest provider of distance education. The center will allow the community college to continue to increase its online offerings, expand its capabilities in course development and offer space for streamed and live video. The proposed renovation also includes state-of-the art training facilities for the hospitality administration program. It will include six lab kitchens, an experiential learning 70-seat restaurant/kitchen, and 48-seat bakery/café, along with three classrooms. The added space will allow the program to double its enrollment to more than 1,100 hospitality degree-seeking students and introduce continuing education classes for the community. In order to free up more classroom space at the Fall Creek and Meridian facility, administrative offices for the president, provost, workforce development and foundation will be moved to the renovated facility. Offices currently being leased by the community college will be moved to the center. The building was constructed in 1965 as Stouffer’s Hotel on the site of the former Stokely-Van Camp mansion. As a hotel it consisted of 300 guest rooms, a pool (now an auditorium), banquet hall, and meeting/conference rooms. The 13th floor contained a restaurant decorated with salvage materials from the Stokely Mansion, including fireplaces, wood and stained glass. 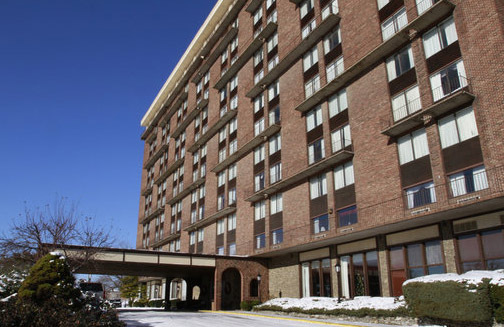 The hotel boasted many famous guests, including Elvis Presley, who stayed there while in Indianapolis, performing what would be his last performance. The building operated as a hotel until the late 1980s. In the early 1990s Bill Gothard and his ministry, Institute in Basic Life Principles (IBLP), purchased the former hotel and began offering regional conferences with practical instruction, motivating messages and family fellowship. The primary purpose of purchasing this building was to expand Gothard’s ministry by partnering with the city of Indianapolis and its juvenile court system to offer spiritual and behavioral training programs as an alternative to incarceration for youthful offenders. It currently houses IBLP’s Indianapolis Training Center.